Day 43 to 45 - The Pamir Highway! The Pamir Highway was one of the sections that we have both been excited about since we first started to plan the trip. The notorious M41 between Dushanbe in Tajikistan and Osh in Kyrgyzstan crosses through the Pamir mountains. A route has existed in this area for thousands of years as part of the legendary Silk Road. The road as it is now was built by the Soviet Military to facilitate troop transport and provisioning across the region. Now days it is primarily used by lorries transporting goods from China into Southern Central Asia. The route winds it’s way through some amazing scenery and over several high passes, up to 4600m - making it the second highest road in the world. Although entirely in Tajikistan the road comes very close to the Afghan and the Chinese borders. Afghan village just across the river Panj. 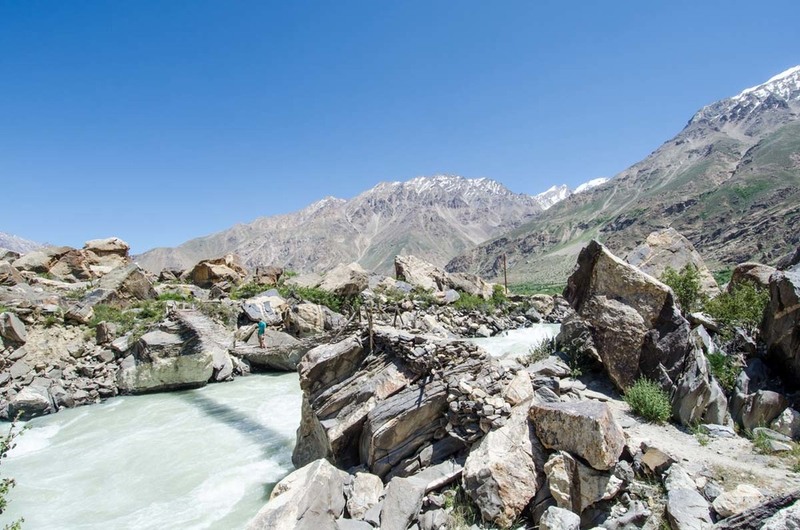 Splashes of green show some Afghan villages amidst the otherwise barren landscape. The Pamir highway is often blocked by landslides, luckily this one had been cleared(ish) recently. Great/exciting mountain roads winding alongside the river. Amazing Afghan village built into the rocky outcrops beside the Panj. First camp on the Pamir Highway, a short distance before Khorog. Winding our way higher up into the mountains beside beautiful rivers. A precarious bridge across a raging snow melt river. Maz looking calm on the rickety suspension bridge made of twigs. We were impressed at how our Land Cruiser handled the terrain…the Pamir Highway in the main road for trade between Southern Central Asia and China and is primarily used by large articulated lorries - fair play! The long road to nowhere! Camp 2 just outside the town of Murghab at over 4000m. Packing up camp, the first time in weeks we have felt the need to wear a jacket! Finally on the Pamir Highway! Peak Lenin across Lake Karakul, apparently rare to see it so clearly. Cruising the Pamir Highway on one of the better sections of road!